Discussions about IITA’s plan to revitalize its plantain breeding in the rainforest station in Onne, south Nigeria, was the center of a presentation delivered by Rony Swennen, IITA banana Breeder, in Port Harcourt. 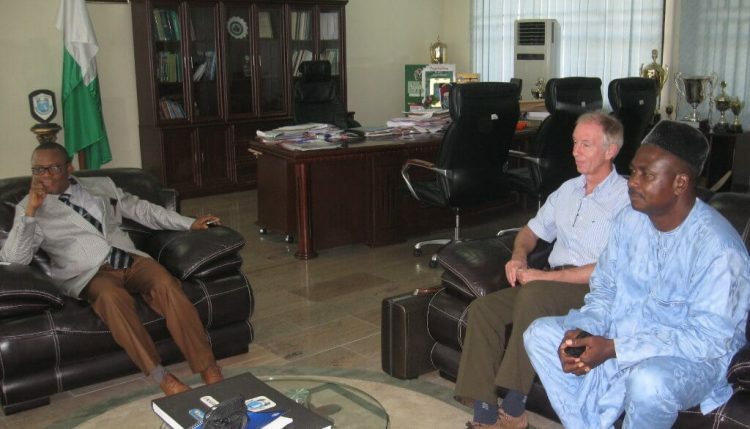 Swennen disclosed this plan during his visit to the University of Port Harcourt for the first public lecture at the Institute of Agricultural Research and Development. The lecture was entitled “The contribution of IITA plantain and cooking banana hybrids for food security in Africa” and was presented to staff and students of the University on 18 November. Courtesy Visit on UNIPORT Vice Chancellor by Rony. From left to right: Prof N.E.S. 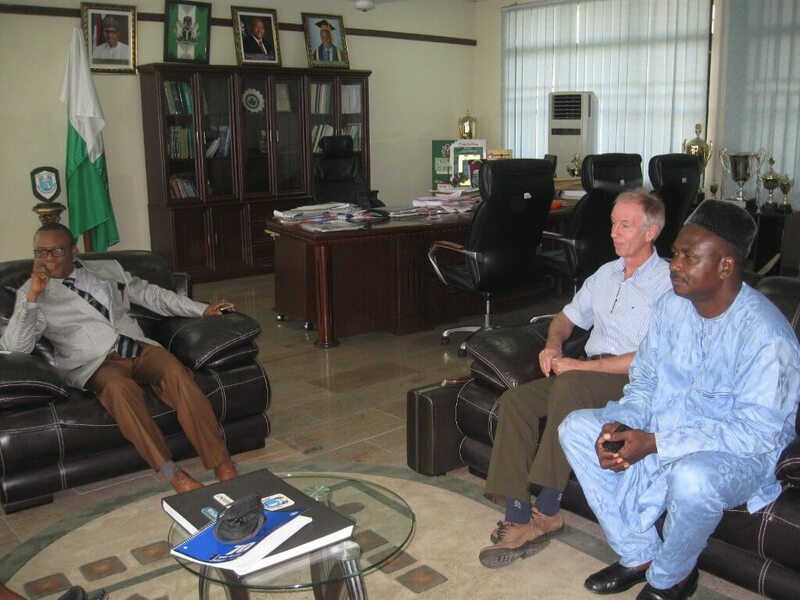 Lale, VC, UNIPORT; Prof Rony Swennen, IITA Scientist; Dr G.E. Omokhua, Director, IARD. From 1976, IITA had operated at Onne –one of the major banana/plantain producing regions in West Africa. At the time, Swennen pioneered research and breeding programs that led to the development and distribution of improved, high yielding and black Sigatoka resistant plantain varieties to many countries across sub-Saharan Africa. These efforts significantly contributed to food security in the region and received international recognitions and awards, including the International King Baudouin Award of CGIAR. These research outcomes were, however, halted in 2005 due to the move of the plantain breeding program to Cameroon and Ibadan, Nigeria. IITA realizes that Onne is unique for plantain breeding as seed production there is superior than in any other location. IITA now plans to revive the station by establishing a center of excellence for banana breeding research and also train young researchers as well as recruit more youth from the south-south region into the IITA Agripreneur scheme that is also planned to be implemented at the station. also highlighted steps being undertaken by management to ensure that the Onne station is fully operational by 2016. This step is also part of efforts to implement the terms of the collaborative agreement with the University signed since February 2013. Congratulations, IITA is proud of you! We are leaving the oil and gas sector for agriculture for the next decade. We are into plantain and banana we hope IITA Onne ll come assist us in Rivers State as IITA Ibadan assisted us in our farm In Edo State. Our vision is to produce alternative food(plantain flour) for diabetic people. Dear Utemeh Chukwuemeka, thank you for your message. We will be happy to assist in whatever way we can. Thanks. Dear Sir, Please I want to know if the Station office in Onne us reopened, as I need assistance in farming? IITA-Onne, PMB 008, Nachia, Eleme, Onne, Port Harcourt, River State, Nigeria. Thank you.